Ardella Baptist Church in Lakeland reached an important milestone two months ago by becoming a debt-free church. 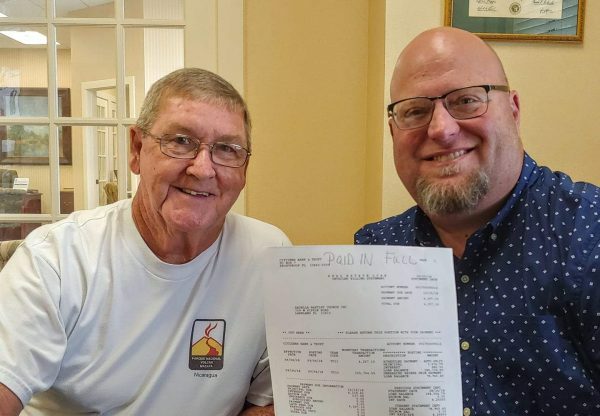 The 96-year-old church paid off $540,000 in debt on Sept. 25 in what was a two-year journey that began under the leadership of pastor Mark Bedwell. “I came to the church about two years ago and at the time the church was down to about 100 core families who were struggling to keep the church just above water,” he said. Every month the church was making a $4,000 payment toward the mortgage on their property, which includes a soccer field and three buildings. Today, that money goes toward being able to serve the community better. For example, the church has wanted to use the soccer field as a community outreach tool for a long time but due to money constraints, they were unable to do so. Now, Bedwell said, they are working toward turning the soccer field into a community park with a walking track, benches, and a children’s play area as a way of attracting families from the community. Bedwell said that his approach to encouraging the church in their debt-free journey was three-fold; he preached about it, made it part of the church’s vision, and kept the goal in front of the people. Ardella Baptist’s vision is to be a healthy family. As a marriage counselor, Bedwell has seen that one of the issues that tears marriages apart is debt. Based on that he knew that for Ardella Baptist to be a healthy family they had to get rid of the debt. On Dec. 16 the church will have its annual business meeting and that night they are planning to burn the bank note and the thermometer they have used to visually represent the debt payoff.